At first glance Israeli novelist David Grossman’s new novel, A Horse Walks into a Bar, which as the title suggests recounts a stand-up comedian’s performance one evening at a night club in the coastal city Netanya, appears to be a complete change in tone and direction from his previous two fiction books To the End of the Land and Falling Out of Time (the latter reviewed on NYJB), emotionally heavy works that either indirectly or directly deal with parental grief. But initial appearances can be deceiving, and though the new novel is seasoned with jokes it is a serious work that addresses emotional pain as a source of all art, even a genre as coarse and vulgar as stand-up comedy. This issue is particularly germane to confessional stand-up, the autobiographical comedy sub-genre whose name is derived from confessional poetry, though it bears a closer resemblance to the memoirs published by well known poets. Proponents of confessional stand-up find its autobiographical narratives emotionally moving and cathartic, while its critics complain that it’s not funny. This controversy is acted out in the Netanya nightclub when our comedian Dov Greenstein tries to perform confessional stand-up to a mostly impatient audience who want to hear jokes. Our first person narrator Avishai Lazar, a retired Jerusalem district judge and a widower, accepts his 57-year-old childhood friend Greenstein’s invitation to attend his gig in Netanya. The two met at age nine when they shared the same after school tutor and haven’t seen each other since they were 14-year-old campers in Gadna, an IDF run military themed one week program to acclimate and prepare high school students for eventual post-high school conscription. Avishai’s recollections of the juvenile Dov provide respite from the nightclub performance. To avoid spoilers this review will reveal few details from those recollections and from Dov’s autobiographical monologue except that he was a short child who was bullied and walked on his hands to confound his oppressors and make it harder for them to hit his face. Otherwise think of John Leguizamo’s autobiographical one-man shows, but swap out his working class Colombian immigrant parents in Queens, NY, for Greenstein’s working class Holocaust survivor parents in Jerusalem. Indeed, classic second generation inherited trauma is another source of Dov’s creativity. While his autobiographical narrative is a moving example of confessional stand-up, his repartee with his hostile audience is as crude, vulgar, bigoted, and misogynistic as one might expect from Andrew Dice Clay in the final decades of the previous century or a rat-pack era comedian from the 1950s, addressing women audience members as “Doll-face” and referring to men as “Daddy-o” (what are those anachronistic terms in Grossman’s Hebrew?). But Greenstein, who refers to himself as “Dovaleh G,” is an equal opportunity offender whose barbs are directed at both men and women, settlers and peace activists, Jews and Arabs. While his comic pacing is initially flawless, as his autobiographical monologue progresses he has to work harder to keep his audience, many if not most of whom have come to laugh and escape reality and are not receptive to the painful personal truth Dovaleh intends to share. But he manages to work jokes into even that sad story. In To the End of the Land, Ora, a soldier’s mother, takes a long hike on the national trail (the Israeli equivalent of the Appalachian Trail) to evade the army representatives who notify next of kin that their loved one has died. In a long section toward the end of A Horse Walks into a Bar Dov, an only child whose parents were the only relatives to survive the Shoah, relates how as a teenager in Gadna he was ordered to return to Jerusalem from a camp just north of Eilat to attend a relative’s funeral, but they don’t tell him which of his parents has died, and he won’t find out until he reaches the cemetery. During the many hours long trip he asks the driver to tell him jokes, another way of evading the inevitable. Ora’s hike lasts a week during which she recollects her son in that epic’s meandering nearly 600 pages Grossman’s account of Dov’s two-hour performance is less than 200 pages, and during Dov’s long drive home in the final section thoughts of his parents, including their Shoah survival stories, crowd out his driver’s jokes (including the one that begins with the book’s title). Both books hold a mirror up to their readers and remind us of Socrates’ statement at his trial for impiety and corrupting youth as recounted in Plato’s Apology that the unexamined life is not worth living. It is somehow fitting that Grossman reaffirms that statement in the voice of a coarse, vulgar stand-up comedian. 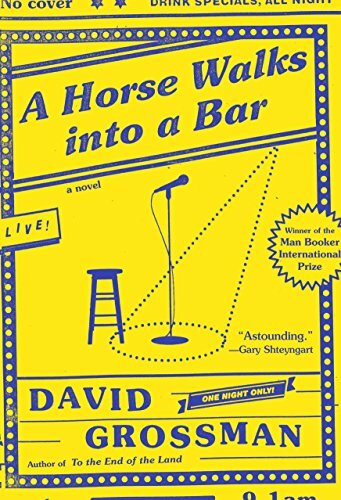 A Horse Walks into a Bar is a poignant examination of the human condition presented with greater concision and faster pacing than Grossman’s earlier work.